Lil'Lift is as simple and effective as its name. 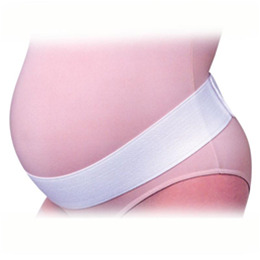 It lifts the belly during pregnancy for maternity back supportand provides tummy reshaping after delivery. Lil’Lift is perfect for the woman who wants smart support from a pregnancy support belt, but doesn’t want all the lift a BabyHugger provides. (Lil'Lift provides about a third of BabyHugger's lifts.) Some women wear a Lil’Lift early and a BabyHugger later as their belly gets bigger and heavier. Lil'Lift relieves backache, abdominal stress, and pelvic and bladder pressure. Our unique latex-free elastic has soft edges for pure comfort. The 3-inch width won’t dig into your groin or fold over on itself as wider belts tend to do. Lil’Lift will stay flat and comfortable -- exactly where you put it. Exactly where you need it. Putting it on ... Wrap the Lil'Lift around you, with the smooth surface next to your skin. Fasten it to itself in the front. (There will be a nice overlap.) Rotate the whole pregnancy belt so that the overlapped fabric is centered in the middle of your low back for maternity back support. Swing the belt under your belly for a soft, gentle lift.Adjust the tension so that it is totally comfortable. After the delivery, Lil’Lift will help support and reshape your recovering tummy.